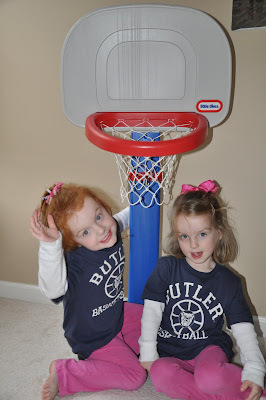 We love Butler Basketball. My little legacies have been pointing out butler license plates on cars since they started talking. Last year, the bracket picks based on mascots was fun, but neither won in the end. This year, Addy lost early, picking the Orangemen while Lilly is the current leader of Jeremy's 85 person pool at work. Our team also has Aunt Cat's law firm in Washington very impressed as our love for the Bulldogs has that anti-sports fan leading their pool. We'll cheer them on next weekend, teaching my girls that good guys win out in the end. Go Bulldogs! Most people who know me, know I love TLC and the brainless television that airs on the network. A new favorite is DC Cupcakes. So, when I ventured to DC last week for a quick trip to visit my sister and see the condo she bought last year, I knew we would need to detour from our plans for an afternoon treat. One afternoon treat turned into an order for a dozen to bring home with us. I'm not lying when I say it was the best cupcake I've ever eaten. 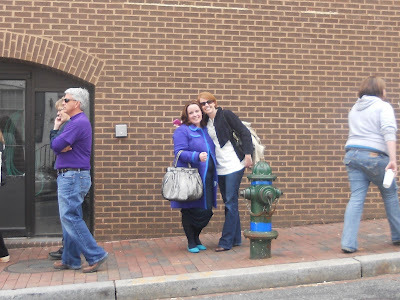 It also helped that Grandma Linda was with me and under strict orders from Addy & Lilly. They told her before we left, "I bet DC has good treats, don't forget about us when your gone." They've mastered the art of manipulation. So, we stood in line, ordered a dozen cupcakes to pick up the morning we left and brought home some DC treats for the girls. Heaven in a little paper wrapper. Lilly picked the chocolate peanut butter chip cupcake from the assortment. Addy picked her mama's favorite--red velvet--delish! L: "Addy, come play dress-up with me." A: "K-I'll be a princess monkey." L: "You can't be a princess monkey, you have to be a princess princess." A: "I can be a princess monkey, my name will be monkey and I'll be a princess"
L: (Always much more linear than Addy) "Fine, but if you are princess monkey, I'll be princess elephant so I can be in charge, cause I'm the biggest." We've officially entered princess territory around here, spending more time in princess dresses this past weekend than anything else. We even went to lunch sporting our princess dresses and Addy in bunny ears. Sure, we got some sympathetic looks from moms who have been there. It wasn't one of my proudest moments as a mom, but certainly not my least either. They were well-behaved princesses. 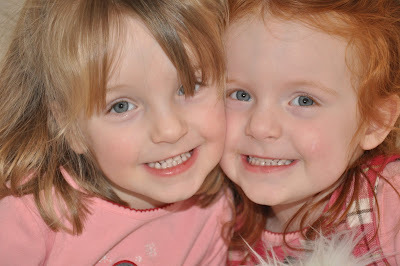 A & L with their American Girl twins--can we say obsessed??? My mother-in-law told me last week that this is the most honest age the girls will ever be. They have no fear to say exactly what they are thinking and also don't have the radar to know what is socially acceptable or unacceptable at this age either. It makes for some interesting conversations. A: "Man, I love those three kids." L: "Mom, I didn't know there was a pond there." A: "If I don't eat anything that makes me big and strong, will I stay 3 forever?" L: "That wasn't much of a birthday party--where was Dr. Suess and why didn't we get cake?" Laying in bed, Addy asked me to listen to her hearts. Mom: "Babe, you only have one heart, it's right here." A: "No, I have two hearts so I can love you with one whole one and love daddy with the other." So, this is what they meant when they said it got easier. The tantrums haven't ended, the "I do it" phase remains in full swing and they know EXACTLY how to push each others buttons and mine, so I wouldn't ever say it's easy....but, it was easier to wrap my brain around traveling with them. It was easier to have them sleepover at my girlfriend's house with us and not worry about all the hassle of pack and plays and packing food. It was easier to take them to a waterpark, stay in a hotel, travel for longer than 2 hours in the car....all of that was easier and we are so thankful! 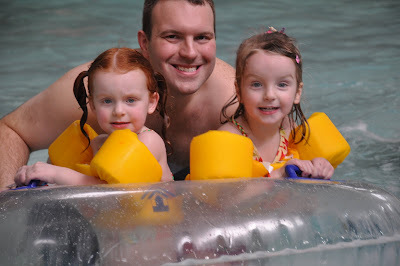 We headed to Great Wolf Lodge in Ohio last weekend for a mid-winter family getaway. They were the perfect age to do it. They understood that it was a special adventure, they got to skip on a nap, stay up past their bedtime and enjoy every minute of their time with us! 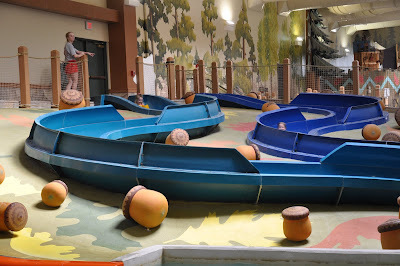 The big slides are over 3 stories tall and they were troopers climbing those stairs again and again and again. 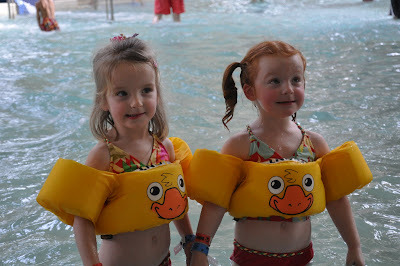 They LOVED the wave pool and the 'pre-school' slides pictured below were a hit too. Can't wait for next year! 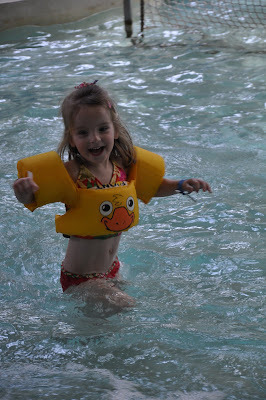 Addy-totally fearless with mommy by her side! 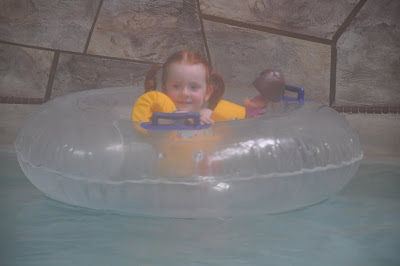 Lilly waiting for the waves to turn on in the wave pool--this was her favorite I think! 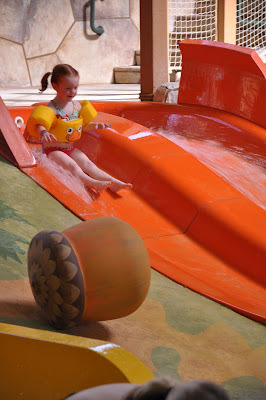 Lilly is quick to tell you this 'orange' slide was her favorite and the 'family' raft ride! Check out the same crooked smile in this pic--like "take the shot and get out of our face mom!"